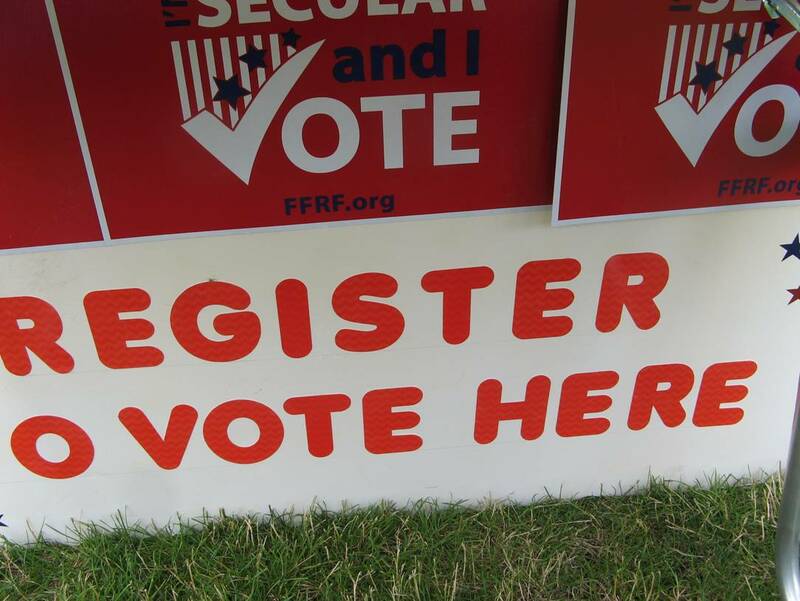 In true Fourth of July spirit, the Freedom From Religion Foundation has proudly kicked off a nationally coordinated secular voting registration drive for the 2018 elections. The state/church watchdog has joined forces with five other leading national secular groups to launch the first national secular voter registration initiative: Secular America Votes! 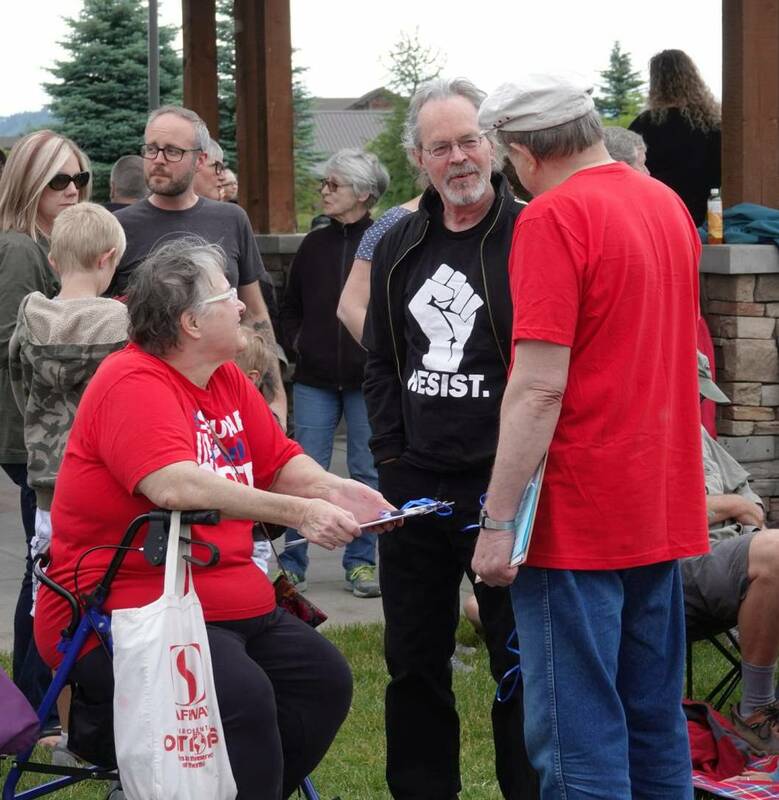 On Saturday, the Inland Northwest Freethought Society, a FFRF chapter working in western Washington and eastern Idaho, conducted the first Secular America Votes registration drive in Coeur d’Alene, Idaho. The vigil and march was attended by roughly 175-200 people in coordination with the nationwide “Families Belong Together” demonstrations. Barker adds that he’s proud of the fact that 97 percent of FFRF members are registered voters (based on a definitive 2015 survey of our members). Unfortunately, that momentum is not reflected in secular voter turnout at large. While “Nones” make up an ever-growing percentage of the U.S. population at 24 percent, more than a quarter report that they are not registered to vote, particularly younger freethinkers. Secular voters comprise about 15 percent of the electorate, according to 2016 studies. Meanwhile, evangelicals, at only 17 percent of the population, still make up more than a quarter of the electorate, a fact which encourages lawmakers to pander to their interests because they know they can count on their vote. Secular America Votes is intended to combat the disproportionate influence of the Religious Right while drawing attention to the growing secular movement. It also provides a welcome avenue for individuals concerned about the turn in America’s politics to do something constructive before the critically important November congressional elections. It’s worthwhile to note that the Idaho registration event was attended by many people who identify as religious in a traditionally Christian area. Despite that, no volunteers reported any problems and were well-received in general. A few volunteers reported being thanked for “being here” to represent the secular community and to provide a valuable service. Secular America Votes is a joint project of national atheist, humanist and secular groups, including Freedom From Religion Foundation, Secular Coalition for America, American Atheists, Center for Inquiry and the Secular Student Alliance. Click here to volunteer for a registration drive near you or to learn more about Secular America Votes.